All of our product reviews are from actual customers! These are a few of our favorites for the month of May. Was looking for something unique for a semi-formal garden wedding because I hadn’t planned to wear a coat, so I wanted a vest that really stood out and looked great, not only from the front, but from the back, too. The Kendall Vest in brown caught my eye, but when it arrived (very quickly, I might add) it was even better in person than in the photos. It fit perfectly and looks great with the Arlington puff tie and silver pocket watch that my bride picked out. What can I say ? Words cannot describe how pleased I am with my vest! It fits perfect, and looks better than pictured. 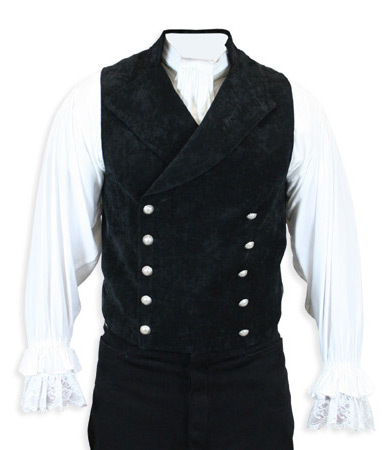 At the Mayfair ball I will be regency dressed.Thank you, Thank you THANK you for great service and a matching product! I had been looking for an inexpensive pair of boots to wear as part of an x-wing pilot’s costume. 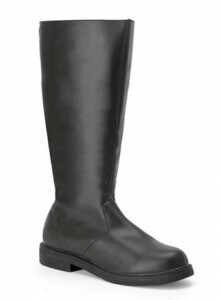 These boots exceeded my expectations in quality and in price. Now I have to make up a flare holder to hang from the top of the left boot. 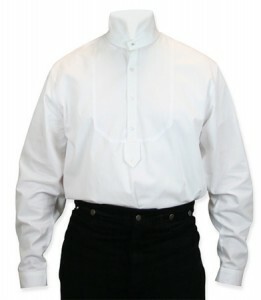 THIS is the Victorian/Edwardian shirt I’ve been looking for all along. Finally a shirt with a properly tall collar that fits so well I may not have to starch it the way I’ve done with other shirts that I’ve worn in the past. The collar is quite comfortable. 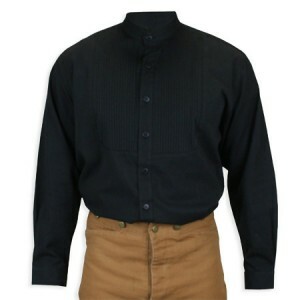 The material is a little thinner than the Frontier Classics Dodge City shirts I’m used to but it fits well and would be cooler to wear in warmer climates. I cannot begin to express how happy I am this shirt is now available. If my budget permits, I hope to order a second one soon. 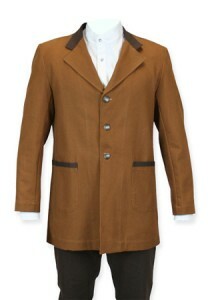 A fine Gentleman’s canvas Ranch Coat, that lends a casual, but stylish aire to any man with vintage era taste. The contrasting materials are distinctive and flattering. The fit was perfect. 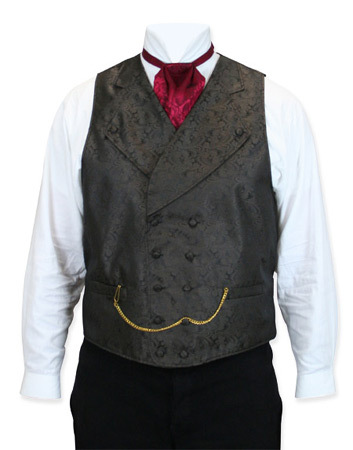 But note that the shoulders are well padded (and visible when the unlined coat is removed from your person), hinting at a scoche more sophistication than your average ranch hand. Great look and fit. Couldn’t be happier and it looks fricken great on!!! Premium Mens Button Spats – Silver Jacquard (One Pair) – Swanky Dude! 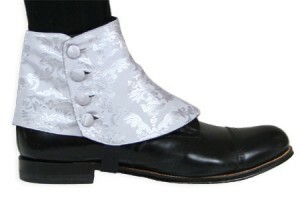 I just received a pair silver jacquard spats. As part of a 1920’s costume it seemed like a good add on. I am very impressed! Good material and nicely finished. Clearly, you get what you pay for. The label stated Historical Emporium so was a unique product. I am very happy with them. 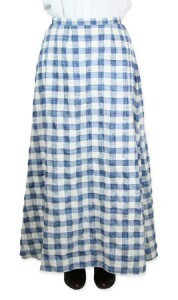 This is my 3rd skirt purchase from Historical Emporium. I again love it. I thought by the picture that the material would be thin. I didn’t really read the description. To my pleasant surprise the material is more like a woven, extremely well made and comfortable. Love, love your site. Little by little I am building my wardrobe for my volunteer work. Thanks again. Click here to see all of our Historical Emporium Customer Reviews! Want to review a product? Be sure to watch for an email from us about a week after your order arrives.